With the release of a new movie about 9/11, we will once again see the horrible images that are burned into our collective consciousness. And, concurrently, many people will again ask the same questions like the one above that they asked years ago in an attempt to make some sense out of this indescribable tragedy. How sad that such questions will continue to remain unanswered because most people in the world lack true knowledge about the Word of God. Rather than let Him speak for Himself by reading and properly understanding the Bible, far too many well-meaning people, Christians included, will venture their own groundless opinions about the critical issue of God’s relationship to evil. Even sincere and loving Christian leaders, called upon for some spiritual explanation by those still grieving, can say only what they have been taught, and the traditional responses to which they are shackled will bring little comfort. Some will mention “evil,” but fail to mention the Devil (Hey—just add a “D”). Thankfully, some Christian leaders will tell the truth that it was Satan who is ultimately responsible for this unspeakable evil, but the majority of dear people asking questions will be left with the false idea that God allowed it to happen as part of His overall will. It is very hard to see how that idea will enhance either their love for or their faith in our heavenly Father. In fact, it will no doubt turn many away from His outstretched heart, wherein lies their only hope for truth, which is the only basis for genuine comfort, strength, and hope. Americans inundated by postmodernism’s “truth” that “there is no such thing as truth” are stuck between a rock (“no standard for right and wrong beyond the mind of man”) and a hard place (their visceral knowing that what happened on September 11 was wrong). What standard can we use to evaluate Osama Bin Laden’s assertion, which he bases upon the words of the Koran, his source of “truth,” that what happened was the will of Allah? We can, and must, use the God-breathed revelation from the Creator of life. And what is the chief difference between the Bible and every other document purported to be the Word of God? The rock, Jesus Christ, who went through a hard place, the world. 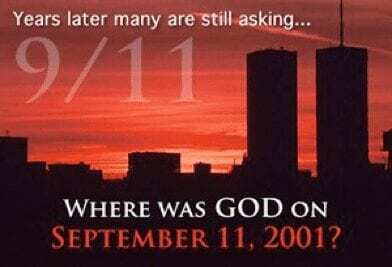 Where was God on September 11, 2001? His answer to that question, taken from His own Word, is: “I was right there looking on in great pain, and unable to stop those planes from crashing into those buildings.” Yes, we have by now heard countless stories of how He worked in a myriad of ways to keep people away from the Twin Towers that day and to save as many as He could who were there, but He could not stop those planes from hitting the Towers. You may be thinking, “What? He’s God! He can do anything He wants to do.” If so, you are contradicting what He says in the Bible. No doubt those who believe that well worn lie do so because of misguided Christian teachers who continue to propound the fallacy that “God is in control” and that whatever happens is somehow in line with His will. Apparently, Jesus did not understand that, however, because he encouraged us to pray that, “the will of God be done on earth as it is in heaven.” Why should we pray that if everything that happens is God’s will? Good question. How do we know that God could not stop those planes? Because He did not. The Bible says that God is love (1 John 4:8), which means it is impossible for Him to do anything that is not loving. Is it loving to “allow” (that is, be able to stop something from happening but choose not to) thousands of innocent people to be killed? No. Okay, then we know that God didn’t allow it, and since He sure didn’t cause it, that means He couldn’t stop it. That certainly brings up the question: Why couldn’t He stop it? And the biblical answer is: He did not have enough human cooperation. Hey, did God stop Goliath? Did He stop the 850 prophets of Baal? Did He stop a number of Old Testament armies bent on destroying Israel? Totally—because David, Elijah, and other people stepped up and did their part. And will God one day stop the Devil, as in crush his ugly head? Absolutely. Why? Because Jesus Christ stepped up like no other man and perfectly cooperated with God, all the way to the Cross. Jesus Christ is the subject of Scripture from Genesis 3:15 to the last page of the book of Revelation, and what the Bible says about him is either true or false. Scripture, history, and the human experience of those who trust him combine to prove that he is the crux of history and the linchpin of life. Those who follow him must proclaim that the written Word of God found in the Bible is the only source of truth because it is the only book showing who Jesus Christ is and why he is man’s only Savior from sin and death. Scripture says that Jesus Christ is also the only valid “…image of the invisible God….” As such, it is he who most vividly shows us God’s heart. Jesus Christ is the key to our understanding that God is not in control of everything that happens; that God’s will does not always happen; that God never causes or “allows” evil; that God gave free will to all men; that God weeps with us in our trauma and sorrow; and that He is there to comfort us. What happened September 11 should make clear to all men that we live in a perpetual war zone. September 11 was a manifestation of the spiritual war raging between God and the Devil, and that war, fought on the earth between godly people and evil people, will go on until Jesus Christ comes back to the earth and wins it! Remember that it was his love for people that cost Jesus his life because the Devil’s total hate could not co-exist with such pure love. What you have read so far may have raised many questions in your mind. Great! because the Word of God has the answers. If you are searching for answers, check out our website and you will be able to pursue your quest for truth and spiritual understanding. Enjoy.